The weather had changed overnight and this morning we woke to find it cold and rainy. 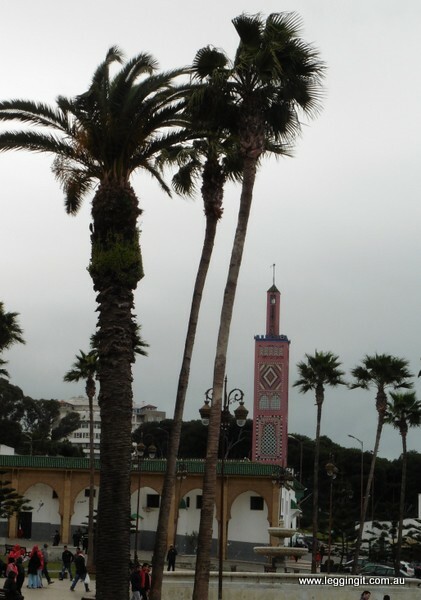 So coats and umbrellas were needed to explore the Tangier Casbah and the Medina. It was definitely cold enough for jackets as we headed to the roof for breakfast. The sun deck was covered in a tarp and surrounded by windows and cane blinds which kept the rain out. Breakfast consisted of a pancake, round flat hard bread, yoghurt, creamy goats cheese, olives, strawberry jam, orange juice, mint tea and coffee. A simple breakfast but the bread was pretty dry and hard to eat without heaps of butter, jam and coffee. It’s just something the locals eat. 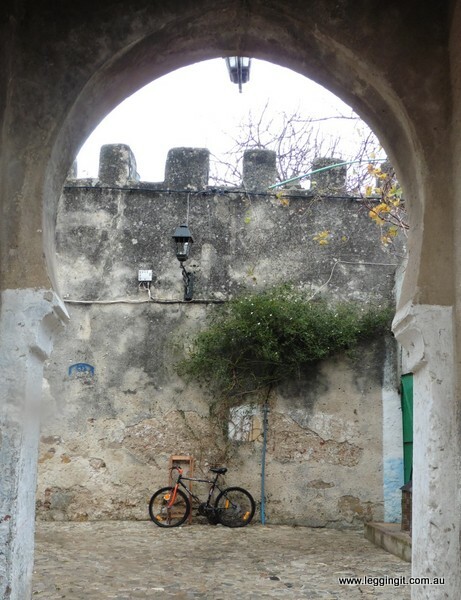 The weather was pretty blustery as we left Dar Rif and after a quick check of the Princess (bike) and salaam to our scowling friend from yesterday we headed up the skinny streets towards the Casbah (Kasbah – castle). 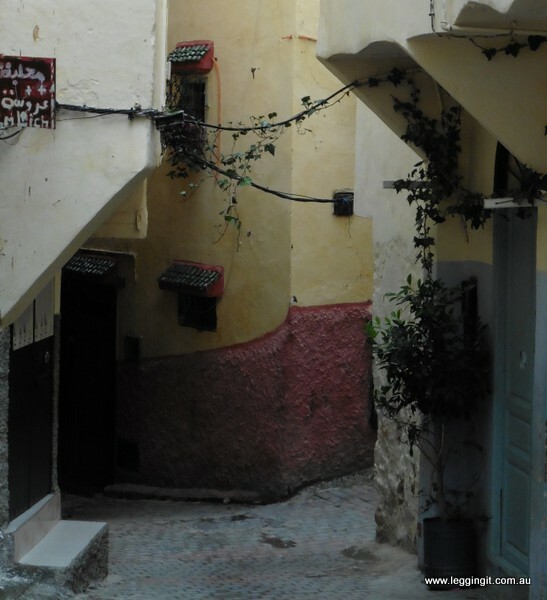 Staying in the medina is like a step back in time with little cobbled lanes like spider webs leading this way and that. From all the movies and fear mongering there was almost a sense of menace as we wandered around not knowing what lay around the corner. Along the way a few people quite happily pointed the way to the Kasbah, which soon dispelled our fears. 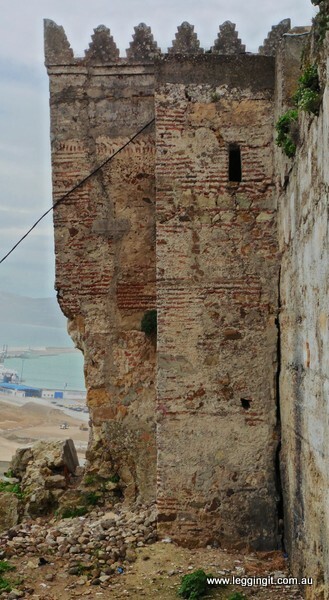 By the time we reached the top of the hill from the medina to the Casbah it was blowing a gale so we took shelter from the wind in the lee of the crumbled walls taking in the view over the port. The Casbah being high on the cliff sure caught all the weather, we had a quick look around at a few of the white buildings inside and decided to head around past the museum. It must’ve been a slow day due to the weather because the attendant was asleep on the desk, which gave us a chuckle. As the rain started again we headed back down to the Medina to check out some of the market stalls. Today was Berber market day and lots of people had made the trip into the city to sell fruit, vegetables and all sorts of handicrafts. It’s quite interesting seeing the different cultural groups in quite striking clothing. 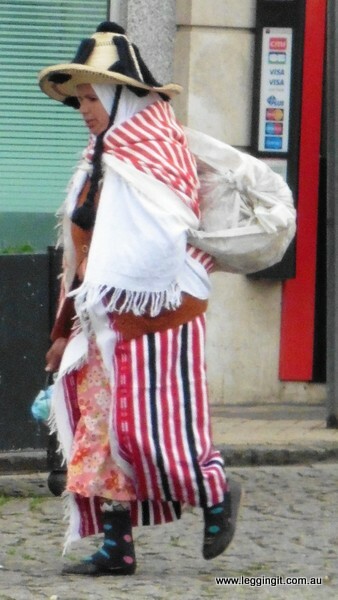 Men in long pointy hooded kaftans, women in straw hats, Berbers in turbans, pretty cool. On the edge of the medina is a big roundabout with a large park and fountain in the centre. We took some time out to visit the old Rif cinema which flanks the roundabout. 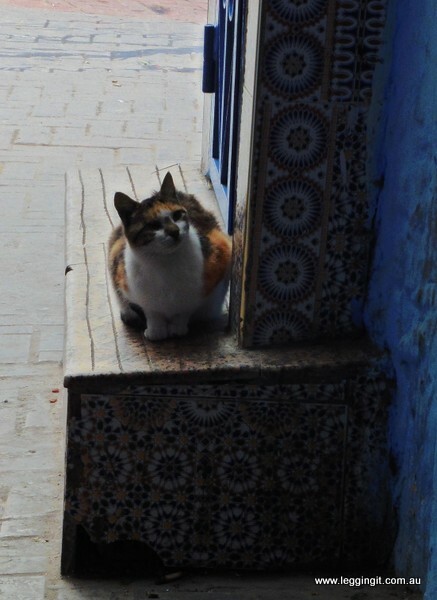 It’s a nice place to take time out from all the crowds of people thronging the markets of the medina. Its pretty old style, a real step back in time. Charlie Chaplins “the Dictator” is shown daily and all different Arthouse style foreign language films are shown sadly no English ones today. It’s also a hip place for some of the young people to hang out it seems. We had a coffee while people watching. 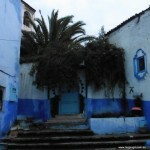 Further up the hill past the Grand Socco is a Church of England church built in Moroccan style with whitewashed walls. It has quite a fascinating cemetery of well kept graves. There’s a war grave section and some old WWII graves. 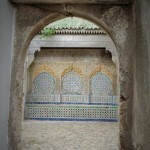 It’s interesting looking at the Moorish styling of the graves, with decorative tiling and such. We also went looking for the gardens featured on the map, however, it seems the only flowers that bloom there were plastic bag flowers, they’re everywhere. Disappointed we headed back to the medina and took a stroll through the fresh food markets which run under the shops. There were piles of olives of different types and all sorts of fresh produce lining the stalls. A truly different way of displaying food. As we returned to the square our old mate from the outdoor eatery spotted us. He’d spotted us yesterday with a map, came across to help and pointed out his fine establishment with reasonable prices. A great bloke who could’ve sold eskys to the Eskimos. The other restaurant spruikers were all baying for our custom but little did they know our old mate had sealed the deal 24 hours beforehand. He had great people skills, a real amiable sort of bloke and it was great to see his son and grandson out learning the family business from the best. 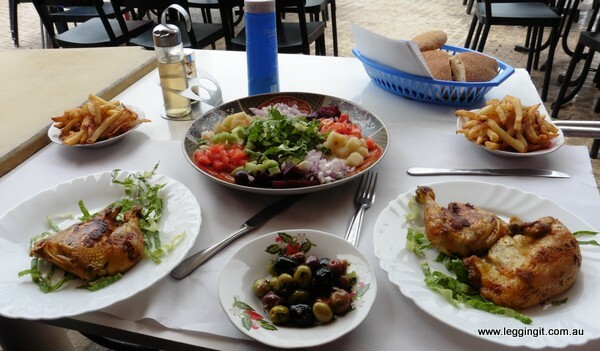 Despite being Morocco and all that lovely food there were chickens on the rotisserie so Chicken and chips were ordered. Soon the table was covered in all sorts of plates, chicken, chips, rice, olives, a massive basket of bread, and the small salad would’ve scared a vegetarian and turned them into a carnivore. Try as we did there was just too much for us. The Moroccans really know how to put on a feast. 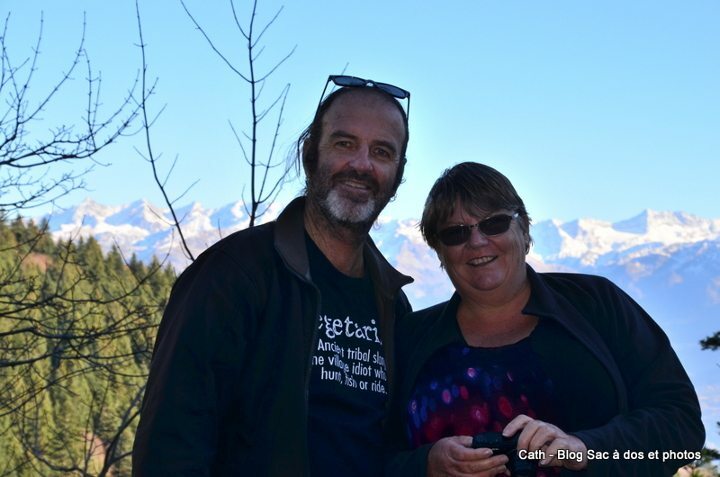 It was reasonably priced too at less than $20 with drinks but best of all…..no tourists and no guides. After lunch waddled back to the hostel for a rest and to look at our travel options. Realistically there’s not much in Tangiers, it’s just a big city with everyone out to make a buck so we’re considering whether to head south down the coast or south east to Chefcaouene, the blue city. 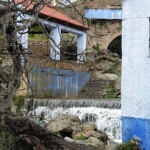 The weather is a big factor if we don’t get out tomorrow we may have days of rain in Tangiers. By the time it was dark we’d decided if the weather was ok tomorrow we’d leave and we couldn’t leave without checking out Restaurant Rif Kebdani. The place our guide told us was only for tourists and we’d all get sick. Well as Rif Kendani doesn’t give him and the other guides a spotters fee it’s quite obvious why he didn’t want us to eat there. As expected our guide was full of bs. We were greeted at the door by a turbaned Berber who led us to our table. A night of food magic was about to commence. The meals were served in theatrical manner, like a magician producing meals of wonder. We met up with a few Americans and two Aussie girls from Newcastle taking a break from working in England. Meanwhile the chef kept sending out titbits for us to try. It was one of the best nights out we’ve had for a long long time. 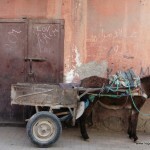 It was quite late by the time we wandered back to Dar Rif after a day which changed some of our opinion of Tangiers. Beautiful pictures! 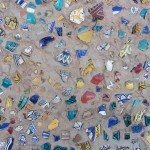 We have not been to Morocco yet, but your post just really made me want to go – it sounds amazing! 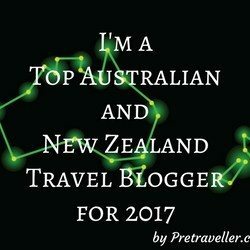 It is definitely worth checking out a country of many different aspects…sea, mountains and interesting cities. 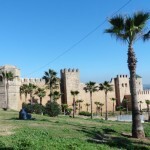 One of my favorite cities in Morocco !